This remark, in the preface to Are We There Yet?, captures much of the essence of this photographic journey, which took place in 1982. Are We There Yet? is actually a republication of an earlier edition that was first published as Nine-Headed Dragon River. 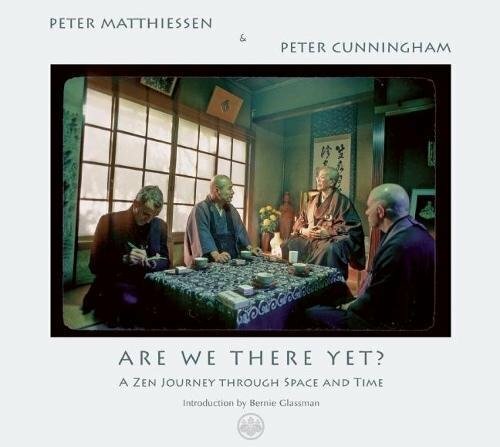 It follows Peter Mattiessen and Peter Cunningham, as they follow Bernie Tetsugen Glassman to Japan, where he visits his Soto Zen teachers and various sites and monasteries. If there is a message in this work, other than providing an historical record for students in this tradition, it is the importance of lineage and one’s willingness to cut through all illusions of self to find our true nature or Buddha Nature (awakened state). The black and white photographs in this travelogue/memoir are both stark and beautiful. The close-up of Bernie Glassman in 1980 displays eyes that are at once intense, deep, and peaceful. There is also a moving photo of an old man sitting on his heals in the mosses, paying no attention to the guests close at hand. The monk explains to the visitors (authors) that, “He was the head priest here. He is retired now and spends his days pulling out the weeds in the stone garden.” Another photo toward the end that captures the book’s focus is one of their teachers, Soen-roshi, walking down a lovely path at Ryutakuji, with the authors walking on either side of him. The picture is taken from behind, and it looks as if they are in a deep and reflective conversation. Except for a photograph of Zen teachers in the final pages (in which it is pointed out that half of present day students and teachers in the west, who are descendents in Maezumi-roshi’s line, are female), there are no photos of such in the rest of the book and women are noticeably absent from any mention in the tradition or lineage that is provided—going all the way back to Shakyamuni Buddha (Siddhartha of Gotama). Mahapajanti Gotami, Yashodhara Gotama and Ambapali from India are absent, as are Jingjian, Lingzhao and Zhidng from China and Zenshin, Ekan Daishi, Kita no Mandokoro, Otagaki Rengetsu, Hori Matsujo and Kasai Joshin-San from Japan and Jiyu Kennett from the U.S. For those interested in learning more about the female line of teachers please see the excellent work by Grace Schireson, Zen Women. If you are a student of one of the book’s authors or a practicing Buddhist or practitioner of Zen, you may find this book of interest. It also has some historical significance due to its presentation of how Zen came to be in Japan and has moved on to the west. The photographs are of high quality and carefully observant. Otherwise, Are We There Yet? will most likely be read and seen only by those immersed in Zen circles or people who are interested in its history and philosophical foundations.